When it comes to your chiropractic website, the trinity of information known as NAP (Name, Address, and Phone Number) plays an integral role in the overall success of your SEO strategy. Sure, it may sound simple enough – be sure to include your name, address, and phone number on your website. 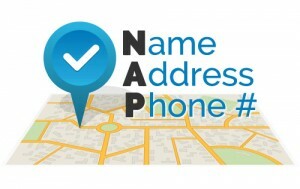 Acting as a digital “business card,” NAP schema markup tells search engines like Google, Yahoo, and Bing the official location and contact information for your chiropractic office. NAP validates your practice in the eyes of these platforms, so they can properly show your practice information in their local search results. When it comes to local SEO, we can’t emphasize enough the importance of precision and consistency. After all, since Google and other search engines can be so meticulous about delivering accurate results to their users, a seemingly minor inconsistency could prevent them from displaying your chiropractic listing altogether! Since Google deals with computer algorithms, they tend to read information quite literally. For instance, Google will see “123 S Main Street, Suite A” as a different address from “123 S Main St., Ste A.” Furthermore, if you’ve moved your practice in the last several years, your address is likely going to confuse Google. And whenever Google is confused, your listing suffers. From the “Type” dropdown menu, select “Local Business,” and then fill out the required information about your practice. Note: Feel free to leave the “PO Box” field blank. It is critical that your NAP information is consistent across the Internet, so be sure to fill out your practice name and contact information exactly as you’d like it to be shown to prospective patients. For example, if your NAP markup shows your address as 167 Olive Ave., you’ll want to abbreviate “Avenue” across all your online citations (Yelp, Google, Facebook, etc.). Once you’ve retrieved your NAP schema markup, you’ll need to add it to your website’s HTML code. You can add it to your footer, but ideally you should add it to the header of every page on your site. By following these guidelines, you ensure that your critical practice information is easily understood by search engines, making it more findable for the countless patients searching for a chiropractor in their area. Ready to take your online marketing efforts to the next level? Download our free eBook and learn 10 simple strategies to get new patients from the Internet!